So what are sinking funds? Sinking funds are basically a super smart way to get intentional with your savings. There were so many times I have personally felt overwhelmed because I didn’t plan enough. Like when June came and it was time to pay for our car’s tabs; or when Christmas was here and I’d pick up a seasonal job just to pay for presents…for one kid. What was I thinking? Now we have a house with 3 kids and I never have those major moments of stress. Those panic stricken, find cash fast moments are over thanks to sinking funds. For Christmas Tom and I, for the last two years, (since we’ve started sinking funds) set aside $100 starting in August to use as our Christmas money. This gives us $500 to spend on gifts, outings, cocoa, whatever suits us. It’s even crazier to think that at one point in our lives, $500 was about what we would drop for just Destiny (our now 16 year old.) Today it’s $50 per kid and that includes stocking stuffers. Although this year we upped our amount a little bit in order to invest in some musical instruments for the kids. Get some other gift ideas here: Non Toys that Encourage Creativity, Learning and Independence. We personally use a mini accordion file folder. Each section is designated for a different financial purpose. Right now we have Christmas, car maintenance, car tabs and Destiny (she has prescriptions, contacts and school always comes up with some new fee.) I also use this same folder to section off the money we budget for our groceries for the month. It is so handy to have everything in one place where it is easy to keep sorted. I also like using labels to keep track of each individual fund. Labels are helpful because I can make my own and mix and match as the year changes. Don’t worry, I’m totally going to share too! Start by creating a list of your upcoming expenses in the category column. Next, make a note of the amount you will be needing to save. After that, write down how much months you have until you are going to need this money. Then, finally, take the amount needed divided by the number of months and you will get your grand total of how much money you will need to save every month in order to save enough for each purchase. Ideally, you will want to take each amount and divide it by the amount of paychecks you have to save. So for car tabs, you need those in 3 months and you need $150. Well, in those 3 months, you should receive 6 paychecks. So for each paycheck you will be setting aside $25. For the larger ones, like $1,000 needed for vacation, you have a little more time. In 7 months you will have received 14 paychecks (give or take.) So you will take $1,000 divided by 14. So in 7 months, if you want to save up $1,000 for vacation, you will need to set aside $70 per paycheck. This might be the part where you are starting to panic. Where are you supposed to get this sinking funds money? What if you don’t have enough to budget for all the things you need to be saving for? Where are you supposed to get the extra money? Look at your budget, see where you can cut back. Are there items around the house you can sell? Bagsy and Swap.com are great online resources. The tough truth is, if these are all things that you need then you are going to have to find that money somehow. Then there are the things that you don’t need. For example: the $100 birthday fund. If you are planning a party for a child, hit up Little Ceasars for some $5 pizzas, buy a cake mix from the store and bake it together. Easy and Fun Kid Baking Projects Brought Strait to Your Door. I can’t tell you the amount of joy and pride a kid is capable of feeling after helping make and decorate their own birthday cake. Now maybe you can shave that $100 back to $50…or even more. If money seems tight, getting serious about budgeting would be a good idea. Check out my posts below, but remember there are also a ton of online options available to help you get started. See some of the options from Brightpeak Financial. If you yourself are struggling to get out of debt and having yet heard about the Snowball Method, you can ready my post all about how we paid off $6,000 in just 6 months! If you are totally unsure of where to start I highly recommend following Dave Ramsey’s 7 Baby Steps as laid out in Financial Peace University. Another great idea is to get yourself set up with a free credit consultation to see if you are able to dispute any of your debts! Starting any new venture can be kinda scary, but I promise this one will pay off and reduce your money panic attacks! Now Sinking Funds are something I can’t imagine our family living with out. I have so much confidence in it this method that I have actually started a super one for Destiny now that she has officially joined the workforce. I want to instill these good saving and budgeting techniques in her and our other kids so that they can avoid some of the serious financial downfalls tht we have had to face. I want you to avoid them too! You bet! So glad you liked them! We do this but I never realized there was a name for it! While I don’t always stay on track with it, when I do, it helps tremendously! Are you keeping all the cash in the accordion file? We’ve been putting it in savings but with a lot of categories, it’s time consuming to keep track of when all the money is in one account. Yeah, we keep it all in a file. It helps me to see and touch the money. I like the idea of separate categories in savings. For me, I’ve realized I do the best when it’s more hands on. That’s why we even take our grocery budgeted money out. Otherwise I tend to just keep on spending! I love your blog Renee!! Thank you Lindsay! It means a lot! this is definitely an awesome way to come up with the much needed money for things like christmas which i am currently wondering where it will come from! I have been there! Setting aside money all year long for Christmas has been such a weight off my mind. Car tabs and Christmas! This is a great way to keep on top of personal finances. We struggle too with limiting the amount we spend on gifts, but it saves SO much when we do! I know…it can be tough creating new habits, but so so beneficial when you can stick to them. This is such great advice. We recently completed a similar exercise at home and it was so interesting and insightful to see where our money was going – and where we could cut back. Definitely keeping this in mind, especially with Christmas coming up! I just started doing this a month ago. I really like your ideas on how to keep it organized. Oh awesome! Good luck as you continue! Boy I wish I had this when I just started to work. I remember spending my entire first few salaries on clothes and shoes. So embarrassing when I ran out of cash before my next pay day. Great article! YUP!!! I am right there with you! $500 gone in a weekend! What a waste. We do this too … but didn’t know this is what it was called – Having a budget and savings for different things gives me such peace of mind. It absolutely does! I’m glad you are benefiting from the process. No matter what it’s called! You mentioned so many great tips! It’s so important to manage finances and unfortunately this is something I wasn’t taught in school. Now that I’m a homeowner and mother, taking care of my finances is a must! Absolutely. I wish I would have started sooner as well! Okay, I love this idea, and I also love the idea of finding sources of funds around the house! I was listening to the stacking benjamins podcast this morning and they interviewed the founder of http://www.decluttr.com/ which is like a lazy man’s ebay. Just another idea to check out. Oooo I will be checking out that site! Thanks for sharing. So glad you enjoy the blog…takes a lot of work and effort, I tell ya. Whew! I’m hoping so! Thank you Vidya! Great tips! It’s so simple, yet I have never thought of implementing these. It’s so easy to get lost in the consumption! It definitely is! This method has worked so great for me and my family! Absolutely! I always thought I would feel constricted but it’s quite the opposite! I absolutely love your info graphics and labels. They are quite catchy and simple but do the job! It’s a very good idea to organize and create a budget especially around this time of year, it can be easy to lose track of where the money is being spent. Thanks so much! I really try to go simple without boring. I appreciate the compliment! This is such a wonderfully informative and detail`ed post. Thank you! 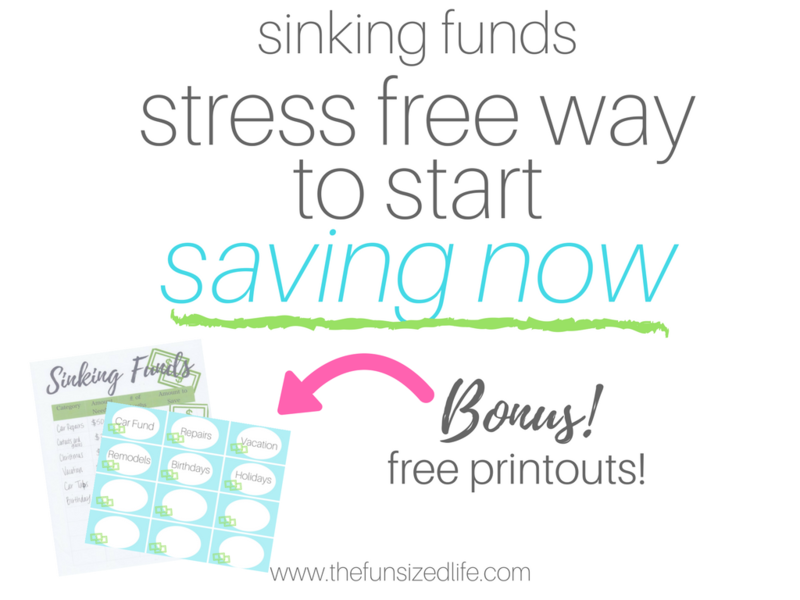 I learned TONS about saving money using Sinking Funds. Love it! I’m so glad you found it beneficial! It has helped our family so much!